As a result of a severe illness, Wolfgang Maly developed his own form of meditation. With this, he healed himself in a way which the doctors believed to be impossible. He now practices this method successfully on other sufferers, and also cooperates closely with practitioners of conventional medicine. This is a healing meditation combined with a visualization of light and a laying-on of hands which was first presented by Joachim Faulstich in the TV documentary “The Secret of Healing”. Maly now explains his healing method in detail for people who wish to use it for themselves. New, ground-breaking methodAstonishing successes with patients who are incurably ill or who can no longer be helped by medicine. Himself affected by serious illness several years ago, Wolfgang Maly developed a form of healing meditation with which he returned to a state of health which his doctors had believed to be impossible. Maly meditation is a combination of prayer, visualizing light and laying on hands. Simple, easy to understand and applicable in everyday life, Wolfgang Maly’s first audio book teaches this new approach to meditation, which is now also used in university clinics. Wolfgang Maly personally guides the listener through the meditation in the instructional CD. In the audio book, we hear reports from cancer and other patients whose diseases were relieved and cured with Maly meditation. The author is passionate about helping people to take action, believe in their healing and do something to bring it about – with Maly meditation. Renowned scientists explain why this is so important. 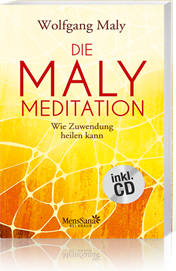 The general public was introduced to Maly meditation by the documentary “The Secret of Healing” made by Joachim Faulstich for ARD television and the book of the same name published by MensSana. Through the method he developed. Today he teaches Maly meditation to many people. Herbert Schäfer’s Passion is talking.